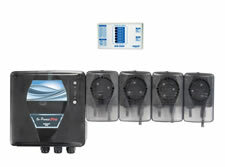 The On-Premise Pro is a versatile unit that has multiple programming options depending on the type of laundry controller that is chosen for the unit. 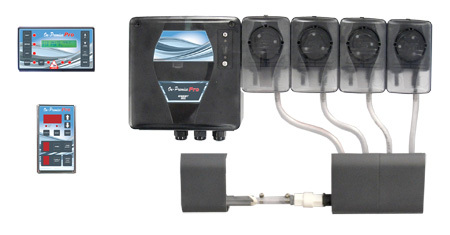 The On-Premise Pro utilizes the same main control and pump housing for the three available models: OP Pro Relay, OP Pro, and the OP Pro Global. The On-Premise Pro uses well proven components and familiar technology in a chemical dispensing unit that is now designed to be more serviceable, interchangeable, versatile, and modular. It has never been easier to choose a dispenser that fits your needs. The OP Pro base unit offers an economical way of reliably dispensing chemical to laundries in nursing homes or other On-Premise laundries. The OP Pro base unit is designed to be a simple and reliable dispenser that operates with microprocessor controlled washers in relay mode. Programming and controls are located inside the main control housing. 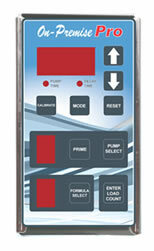 The OP Pro base has the ability to be enhanced with the addition of the OP Pro or OP Pro Global remote. capability, the OP Pro is ideal to service small on-premise accounts. The OP Pro Global remote offers 30 wash formula capability, comprehensive programming features, and data management capabilities. These enhancements allows an on-premise facility to be able to manage cleaning costs and efficiently operate like larger commercial laundries. This is more ideal for accounts that need more capabilities and attention like hotels, laundry houses, and linen factories.